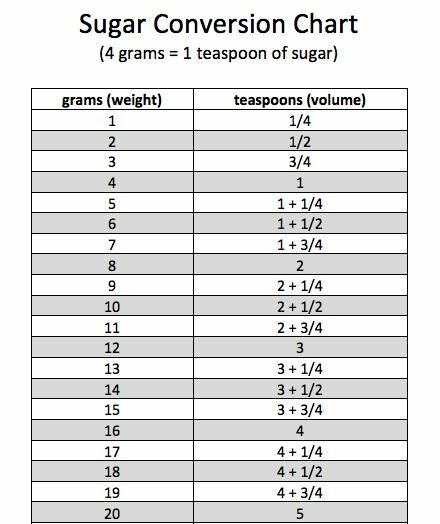 Home Nutrition and Diet How Many Grams of Sugar per Day? The average person eats far too much sugar during the day. Cookies, soda and cake are obvious sources of sugar, but you can also find this sweet substance in foods like pasta sauce, cereal and almond milk. Unfortunately, consuming too much sugar has been linked to a range of conditions like heart disease, type 2 diabetes and obesity. Because of this, it is important to make sure that you are not consuming excessive amounts of sugar. 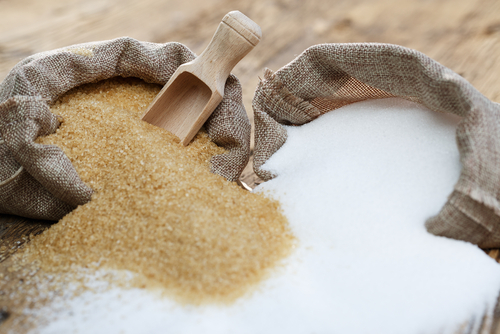 How Many Grams of Sugar per Day Should You Have? Before you know how much sugar to consume, you have to recognize the source. Natural sugar is found in fruits and vegetables, but this is generally not the type of sugar that you should be worried too much about. In addition, you will have to take your weight and height into consideration when determining the right number of grams of sugar per day. The United States Department of Agriculture (USDA) does not actually have a recommendation for specific types of sugar. There are a few other recommendations that you can use to figure out the right amount. You can find natural sugar sources in food groups like dairy, fruit and vegetables. Vegetables: This type of sugar is generally good for you to have. You are actually supposed to eat 2 to 2.5 cups of vegetables every day if you are a woman. If you are a man, you should be eating 2.5 to 3 cups of vegetables. This works to one cup of raw or cooked vegetables, or two cups of leafy green veggies. If you are juicing them, it will work out to around a cup of vegetable juice for every cup of recommended veggie intake. If you are concerned about your intake of sugar, you can use low sugar veggies instead of high sugar veggies. A serving of raw carrots contains around 6 grams of natural sugar while a cup of cooked broccoli has just 2 grams of sugar. Meanwhile, two cups of spinach includes just 0.3 grams of sugar. A cup of tomato juice has a whopping 9 grams of sugar. Fruit: You should eat roughly 1.5 to 2 cups of fruit every day. This should be the main source of your natural sugar intake. A cup of chopped up fruits or half a cup of dried fruit is the equivalent of one cup serving of fruit. Fruits are naturally higher in sugar, so you may want to stick to lower sugar fruits like blueberries and pears. Fruit juices and dried fruit will tend to have more sugar per serving. A cup of raisins has 43 grams of sugar, while a cup of orange juice includes over 20 grams of sugar. Dairy Products: Dairy is another source of natural sugar. The USDA recommends getting 3 cups of dairy per day, but you do not necessarily need this amount. Many foods like kale and spinach actually include calcium, so you can switch some of your dairy intake to leafy greens to get less sugar and more nutrients. If you are consuming dairy, one cup serving is the equivalent of 2 ounces of processed cheese, a cup of milk, 1.5 ounces of natural cheese or a cup of yogurt. A cup of 2 percent milk has 12 grams of sugar, while a cup of flavored yogurt will have about 47 grams of sugar. Leafy greens have less sugar and some types have more calcium than milk, so you may want to switch some of your dairy intake to leafy greens instead if you want to lower your sugar consumption. Unfortunately, nearly everything you buy at the store will contain added sugar. This type of sugar is generally not healthy for you to consume, so you should minimize your intake. The best way to know the amount of sugar in a specific food is by reading the nutritional label to see. According to the American Heart Association, these are the recommended amounts of added sugar that you should consume each day. These are the maximum amounts, so it would be better for your health if you try to consume less. – Women should eat less than 25 grams (6 teaspoons) of sugar every day. – Men should eat less than 37.5 grams (6 teaspoons) of sugar every day. – Children aged 4 to 8 should eat less than 12 grams (3 teaspoons) of sugar every day. – Teenagers should eat less than 20 to 32 grams (5 to 8 teaspoons) of sugar every day. – Preschool children should eat less than 16 grams (3 teaspoons) of sugar every day. The World Health Organization says that no more than 10 percent of your daily caloric intake should be made of sugar. If you have a 2,000 calorie diet, this means that you should have less than 50 grams of sugar in your diet every day. – Avoid cookies, candy, cake and other sweets. – Instead of having baked goods like cake or cookies, try a scone or croissant. – Read the nutritional label on every food you buy to make sure that it is not high in sugar. – Use cream cheese, a sliced banana or peanut butter instead of marmalade or jelly on toast. – Skip breakfast cereals that are high in sugar. Instead, find cereal that is primarily made of whole grains. – Cut the amount of sugar in your recipes by half. The taste won’t be noticeably worse, but your waistline will appreciate it. – Skip fizzy drinks like soda. It is always better to drink water or milk instead. Do not add sugar to tea or coffee. – Eat fresh fruits instead of dried fruit, fruit juice or canned fruit. – If it is hard to stop using sugar at first, gradually reduce the amount so that you do not notice the difference.